My laundry closet is one of the more… uh… interesting improvements made by the previous homeowners. It was created by cutting a large doorway into the hall wall and taking space from an already small bedroom. While having the laundry on the main floor (rather than in the basement) is very convenient, what's left of the bedroom is an awkward L-shape and only six feet (about 2 meters) wide. The laundry closet is behind the large set of bi-fold doors on the right side of the hall. Apologies in advance that some of the makeover pictures are a little awkward. With the narrow hall, it's impossible to get pictures of the closet from a distance. The laundry closet was functional but not at all attractive - dreary beige walls, white laminate shelves, and a sad little fluorescent light. It needed a makeover! I began the makeover by taking the shelves off the walls. I discovered they had been hung with toggle bolts. Ugh. Removing toggle bolts is the stuff of homeowner nightmares. The fundamental problem is that removing a toggle bolt requires contradictory motions. To turn the screw, you have to push on it with a screwdriver… but at the same time, you have to pull on the screw because otherwise, the toggle is just merrily spinning around and around, mocking you from inside the wall. With the perfect combination of tools, technique, perseverance, and luck, you might be able to accomplish the simultaneous pushing and pulling, remove the screw, and be rewarded with the sound of the toggle falling down inside the wall. If you can’t get the tools, technique, perseverance and luck just right, you will not be able to remove the screw. You then have the pleasure of using more tools to decapitate the screw and hammer it and the toggle into abyss behind the wall. After this epic struggle, you are left with a large hole in your wall. Or in my case, several large holes. On a textured wall which makes holes difficult to patch. The makeover would need to include some way of hiding those holes. Removing the washer and dryer revealed a patchwork of vinyl flooring, clearly remnants of the sheet vinyl that had been put in the kitchen around 1994. There was obvious water damage to the baseboards, though thankfully none to the subfloor underneath. I removed the baseboards, which had been glued and screwed into place. After cleaning the walls, I painted them. For a change from the black, grey and purple that fill the rest of my house, I chose a dark aqua/sea blue color. I installed new flooring. I used the same waterproof, wood-look vinyl plank as in my bathroom. Then commenced my futile quest for studs in the wall. Despite an exhaustive search, I found nary a stud in the upper half of the wall. I think the builder must have hung the drywall sideways, spanning the entire width with one 8’ piece. With no studs, I’d have to resort to toggle bolts and/or some other type of strong drywall anchors to hang shelves. Many of the previous toggle bolts had pulled halfway through the wall, leaving the shelves hanging rather precariously. I did not want a repeat of that. I decided to build something like a freestanding shelving unit which would have "legs" or side supports down to the floor. I measured the space and the items I would be storing to determine the size of the shelving unit. The top shelf would be 28" below the ceiling, and the bottom shelf would be 12" below the top shelf. I would have preferred to place the bottom shelf lower, just at the top of the washer and dryer, but the electric outlet and water supply lines were in the way. I sketched out a plan which would use standard sizes of 1" thick boards (which are actually 3/4" thick, because that is how much sense the American system of measurement makes). I purchased the wood and had it cut to size at my local home improvement store. To build the shelving unit, I first secured 1” x 8” boards to each side wall. These would be the legs of the shelf and bear much of the weight. For the top shelf, I placed a 1” x 12” board on top of the legs and secured it with screws down into the legs. For the bottom shelf, I created supports by screwing short pieces of 1” x 3” to the legs. Then I placed a 1” x 8” on top and secured it with screws. For additional support, I used a 1” x 4” to create middle legs. Later, I also added a metal shelf support in the middle for the top shelf. I installed new baseboards around the shelving unit, then painted everything the same color as the walls. The washer and dryer then returned from their brief vacation in my living room. That looks great. I quite like HLhoe you have separate place for your washing. In the UK washering machines our normally in the kitchen.OR utility room if your lucky enough to have one. Thanks! Placement varies here, though laundry closets are pretty common. In many newer (bigger) homes, the washer and dryer get their very own room. That's interesting, I know from my experience of couch surfing in the states some homes are in the basement or have to go the launderette. Interesting. Its clever to have a laundry closet. 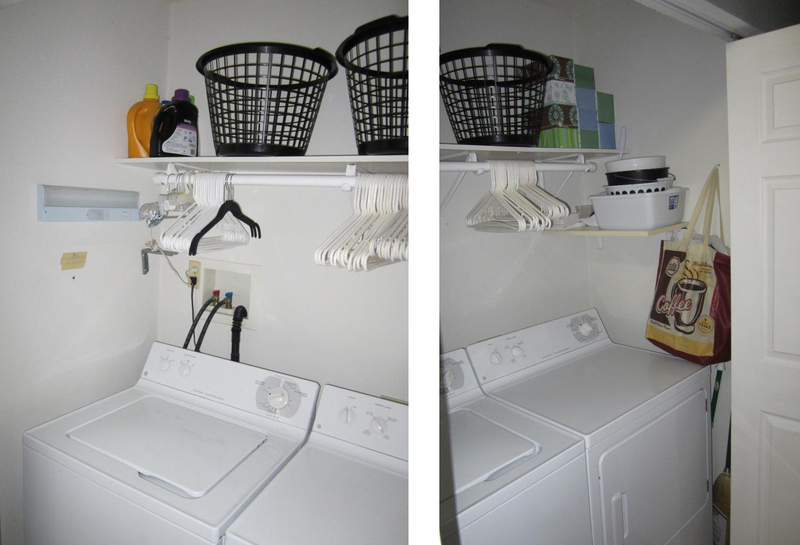 In Swden we usually have a laundry room in the basement or a combined bathroom and laundry room.